Weirdness isn't purely the reserve of marine fish, so this week I thought we'd look at a freshwater oddity, the Mississippi paddlefish or spoonbill, Polyodon spathula. Coming from the same ancient order as sturgeons, and little changed from their Cretaceous ancestors of 145 million years ago, paddlefish look rather like a miniature basking shark with an oar stuck on their nose! 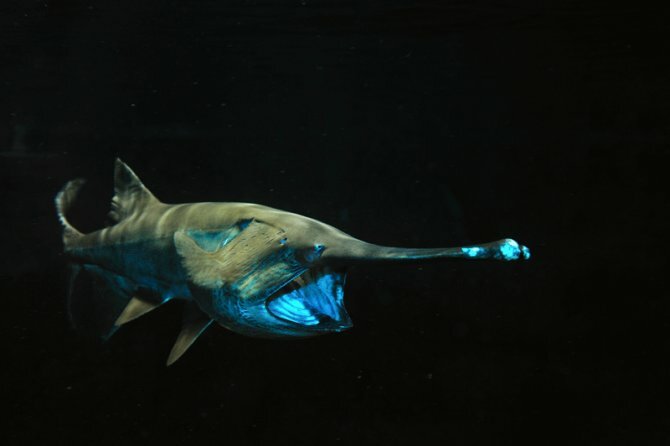 The similarity to the giant marine plankton eater is no coincidence as the paddlefish itself feeds largely on the zooplankton found in the sediment rich, slow moving, murky Mississippi river system of North America. Growing to a maximum of around 2.2 m/7ft and weighing up to 100kg/220lb, these gentle river giants spend their time swimming with mouth agape, filtering their microscopic prey from the water with the aid of gill rakers (see the video below). The bizarre paddle-shaped rostrum, which can be as much as 50% of the fishes' body length, is thought to serve a dual purpose, helping channel plankton towards the mouth while at the same time being covered in electroreceptors used to detect prey as well as navigate its murky habitat, day or night. Tragically, like the vast majority of giant river fish species worldwide, the paddlefish is threatened within its native range with a number of factors at play in this situation. They are a popular food fish for both their meat and roe (sold as American Sevruga Caviar) and both legal and illegal harvest of the species are major population pressures, while introduced Asian carp (also filter feeders) are in many areas found in plague level populations and as a result outcompete the slower breeding paddlefish for available food. Despite this the USFWS (US Fish & Wildlife Service) believe current populations (10,000+ adults) can sustain harvest at the present level, but the IUCN red list lists the species as "vulnerable". There is one other species of paddlefish, Psephurus gladius known as the Chinese swordfish. This larger fish is native to the Yangtze river system but is listed as "critically endangered", with many believing it already extinct as the last confirmed sighting of a live specimen was in 2003. Why not check out some of our other Weird fish of the week features?